German news publishers are picking up where the Belgians left off, a now not-so-proud tradition of suing Google for being included in its listings rather than choosing to opt-out. This time, the publishers want an 11% cut of Google’s revenue related to them being listed. Back in 2006, Belgian news publishers sued Google over their inclusion in the Google News, demanding that Google remove them. They never had to sue; there were mechanisms in place where they could opt-out. After winning the initial suit, Google dropped them as demanded. Then the publications, watching their traffic drop dramatically, scrambled to get back in. When they returned, they made use of the exact opt-out mechanisms (mainly just to block page caching) that were in place before their suit, which they could have used at any time. In the case of the Belgian publishers in particular, it was difficult to understand what they were trying to accomplish. After all, isn’t the goal more page views (it certainly was in the end!)? The German publishers in this case are being a little more creative: like the Belgians before them they are alleging that Google benefits from their content, but instead of risking their traffic by leaving Google, they’re instead demanding Google give them a cut of the revenue they feel they deserve. The obvious reaction to this case, as with the Belgian one, is to marvel at the publisher’s nerve; after all, as we saw with the Belgians, Google is driving traffic from which the publishers profit. “Ganz im Gegenteil!” say the publishers. “Google would not exist without our content.” And, at a very high level, I suppose that’s true, but it’s true in a way that doesn’t matter, and understanding why it doesn’t matter gets at the core reason why traditional journalistic institutions are having so much trouble in the Internet era. 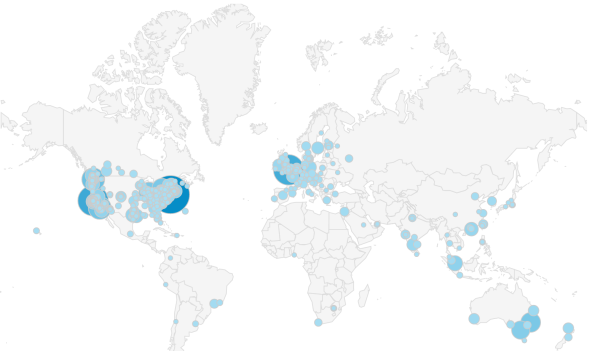 The city-by-city view of Stratechery’s readers over the last 30 days. To be clear, this is absolutely a boon, particularly for readers, but also for any writer looking to have a broad impact. For your typical newspaper, though, the competitive environment is diametrically opposed to what they are used to: instead of there being a scarce amount of published material, there is an overwhelming abundance. More importantly, this shift in the competitive environment has fundamentally changed just who has economic power. In a world defined by scarcity, those who control the scarce resources have the power to set the price for access to those resources. In the case of newspapers, the scarce resource was reader’s attention, and the purchasers were advertisers. The expected response in a well-functioning market would be for competitors to arise to offer more of whatever resource is scarce, but this was always more difficult when it came to newspapers: publishers enjoyed the dual moats of significant up-front capital costs (printing presses are expensive!) as well as a two-sided network (readers and advertisers). The result is that many newspapers enjoyed a monopoly in their area, or an oligopoly at worse. The Internet, though, is a world of abundance, and there is a new power that matters: the ability to make sense of that abundance, to index it, to find needles in the proverbial haystack. And that power is held by Google. Thus, while the audiences advertisers crave are now hopelessly fractured amongst an effectively infinite number of publishers, the readers they seek to reach by necessity start at the same place – Google – and thus, that is where the advertising money has gone. And so, the German publishers are both right and wrong. Without content generated by others, without the proverbial hay, Google would not exist. But at the same time, as the Belgian publishers learned eight years ago, any one publication is but a single haystalk, easily blown by the wind or trampled underfoot, and no one cries – or worse, even notices – when it is gone. Certainly not Google, and certainly none of the advertisers who provide the money to which the German publishers wrongly feel they are entitled.